The U.S. military had the clever idea of identifying and prioritizing the Saddamist enemy by assigning each of the leaders a playing-card equivalent: Saddam Hussein himself was the ace of spades, on down to the 2 of clubs. This idea then caught on and all sorts of decks of cards proliferated. For example, newsmax.com offers a "Deck of Weasels." Enter the well-known French author Thierry Meyssan. He's best known for his creative notion, turned into a bestseller, 11 Septembre 2001 : L'effroyable imposture (translated into English as 911: The Big Lie), arguing that there was no plane that hit the Pentagon; rather, this was a U.S. government conspiracy to justify the war on terror. 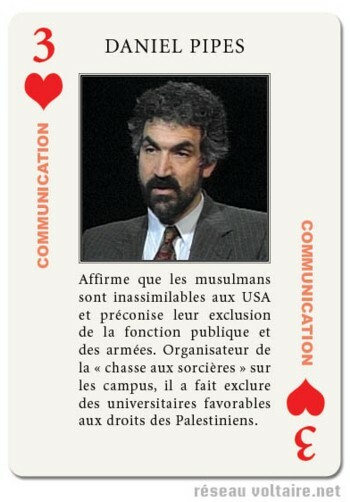 Well, Meyssan in August 2003 designed cards of "Les 52 plus dangereux dignitaires américains" (also available in pdf format). Better yet, they are available in English and Italian translations. Not only are many of my friends there, but so am I, starring as the three of hearts. Do I really need to point out that both of Meyssan's description of me is as distorted as his understanding of what happened at the Pentagon that terrible day? Asserts that Muslims cannot "melt" into US Society and thus recommends their exclusion from Civil Service and the Army. A chief organizer of the witch hunt on US campuses, he orchestrated the eviction of academics favorable to Palestinian rights. What Thierry Meysson is selling for two Euros. Nov. 18, 2004 update: I may be one of the "52 most dangerous American personalities" but I am also someone who Thierry Meyssan is ready to make a profit off of. Thanks to Alain Jean-Mairet, my weekly columns regularly appear in French, gratis, on this, my own website, and on other websites. 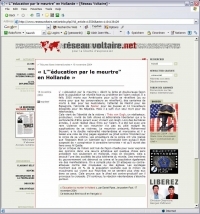 In particular, my column last week, "[Theo van Gogh and] ‘Education By Murder' in Holland," appeared here as "«Éducation par le meurtre» en Hollande." Curiously, an awkward summary of it (as well as a link to the Jean-Mairet translation) also appears at Meyssan's website, but he sells it for two euros. Comment: Being a true believer in conspiracy theories and a huckster often go together, something I note in my two books on conspiracism.